Dan Henderson defeated Fedor Emelianenko by knockout in the first round of their Strikeforce & M-1 Global: Fedor vs. Henderson main event on Saturday night in suburban Chicago. The former Pride 185-pound and 205-pound champ took out the former Pride heavyweight champion with strikes and scored the technical knockout. Fedor and Henderson started out scrapping with an intention to hurt each other. A left hand by Henderson connected and opened up a cut on Fedor’s face and the two scrambled into a clinch on the fence. A short while later, the two separated and and Fedor turned on the firepower, pressuring the smaller fighter. Henderson went down from the flurry and Fedor followed him to finish him off, but Henderson slipped away from harm and got Fedor’s back. It was this moment that Henderson hit the Russian heavyweight with an uppercut from behind. “The Last Emperor” fell face-first to the canvas and seemed unresponsive. At that time, Henderson landed three more strikes and referee Herb Dean stepped in to stop the fight at 4:12 of the opening round. An ecstatic Henderson ran around the cage and sat atop the fence, raising his hands in victory to the cheer of the Illinois fans. “I’ve been a huge fan of Fedor’s forever,” Henderson said following the first round knockout. “I respect him so much as a fighter (for) what he has done for the sport. For me, that’s a huge accomplishment. 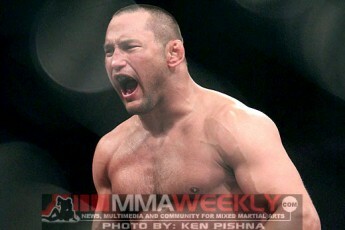 The win was also the last fight on Dan Henderson’s Strikeforce contract. Going forward, the Strikeforce light heavyweight champion would like to defend the belt he earned, but knows his future lies in the hands of the people who write the checks. Following the loss, one might argue that the stoppage was premature, since a split-second before the fight was called, Emelianenko turned to fight off his back. The defeated fighter shared this opinion. Following his previous loss to Antonio “Bigfoot” Silva, Fedor had made mention of retirement. With another loss under his belt, he was asked if retirement was something he would consider now. Henderson gets his third straight win and will await contract negotiations to determine what his next move is. Fedor, who was once considered the world’s best mixed martial artist, drops his third straight fight and the world awaits his decision on if he’ll ever fight again. Got something to say? Weigh in with a thought of your own in the comments section below. Erik Fontanez is a staff writer for MMAWeekly.com. Follow @Erik_Fontanez on Twitter or e-mail Erik a question or comment.